Extravagantly large artworks take up much space in order to achieve their full potential. Not everyone has the right amount of space, which is why we at KunstLoft proudly present you with paintings and decorations in every size. We offer handcrafted sculptures and metal wall art in small, medium to large size, so you will surely find the ideal item for your bedroom or doctor’s office. Our acrylic paintings too are available in different sizes. A painting with the dimensions 55x28 inches is an eye-catcher in landscape format ideal for your office wall, with which you can leave a lasting impression on your clients. Handmade canvas paintings are fun and can create an atmosphere you desire. and add creative accents in your hotel or kitchen. Every canvas painting or sculpture from KunstLoft is either hand-painted or crafted by hand. 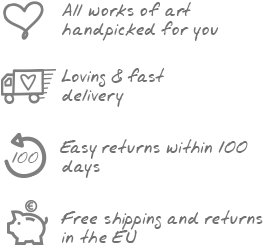 Our artists only use high quality materials and each piece of artwork has passed through a strictly regulated quality control before it is available for you. Therefore you do not need to hesitate any further, just browse through our whole selection and find what pasts the best with you and your style of decoration! With the change of colour, a mid-sized decoration will also have a very different effect on the viewer – the sculpture jumps out immediately if it is in a vibrant shade of red, whereas the same sculpture painted in a subtler green colour will invite the viewer to observe it again and again. Similarly you can opt for a more conspicuous motif, such as a hand-painted parrot which astonishes any viewer effortlessly, or play it safe with classic painting motifs. Medium-sized decorations move in the golden middle of the sizes, giving the final touch to a modern interior. Their unobtrusive, but not to be overlooked size enriches your office. With our abstract wall objects and standing figurative sculptures you have the choice.